Omnistar Recruiter is a dynamic recruiting software solution that gives you the ability to post jobs, manage resumes and give employers the ability to access this information. The software includes many value added features to help streamline your recruiting process: * Give Employers Selective Access - The Omnistar Recruiter employer management module will give you the ability to customize the access levels of third party employers. These employers will be able to access jobs and manage resumes in specific categories that you define. 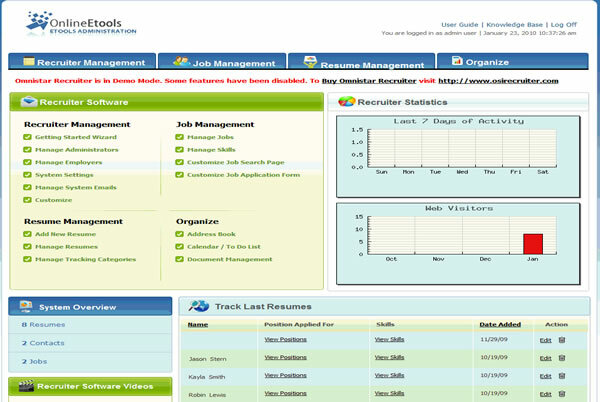 * Screen Candidates Through Customized Application - You will be able to create a customized job application that has your own specific questions so that you can screen candidates before even speaking with them. * Import / Export Jobs and Resumes - The import/export features of Omnistar Recruiter will allow you to take info from another system and easily import it into the database. You will also be able to export data that you may need to use in an external system. * Easily Find Candidates using Advanced Search - The customizable advanced search component will allow you to easily taylor your searches so that you can find candidates that have applied for specific positions. * Multi Administrator Access - Omnistar Recruiter will allow you to create multiple admin accounts which each can have access to only certain areas of the admin area. When creating multi admin accounts you can give various staff the ability to manage certain aspects of the software. This site does not contain serial number, crack, keygen Omnistar Recruiting Software serial number : serial number is the simplest type of crack. A serial number(cdkey,product key,etc) is register the program as you may already know. a crack or keygen may contain harmful software. If you cannot find the exact version you want, just give it a try. for more information read .nfo/.txt/.diz file include in zipped file.